Greenville, South Carolina - Alpha Phi Alpha Foundation and Gamma Gamma Lambda Chapter of Alpha Phi Alpha Fraternity have selected Mr. James Everett Tillman II of Simpsonville, South Carolina as the 2014 winner of the Luke H. Chatman Scholarship. 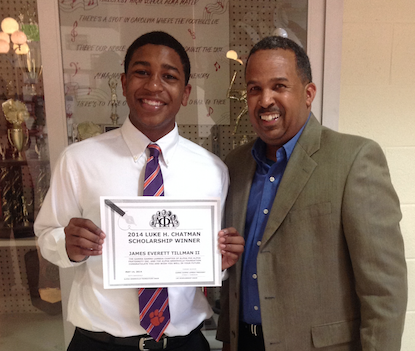 Mr. Tillman is a senior at Hillcrest High School and plans to attend Clemson University in the Fall 2014. Mr. Tillman was presented the scholarship the award on May 15, 2014 at the Hillcrest High School Award Program by Bro. Kynan Robinson, Scholarship Chairman and Board Member. The Scholarship is for $3000, $750 per year for four years and Mr. Tillman joins the two other students the Foundation is support at various school in the state. For further description of the scholarship and a full list of scholarship winners please view the scholarship pages on this website. Brother Luke Haze Chatman was born on August 18, 1921. He was initiated into Gamma Gamma Lambda of Alpha Phi Alpha Fraternity, Incorporated on May 18, 1949. As a dedicated member of Gamma Gamma Lambda Chapter, he held many chapter officers including Treasure, Secretary and President. In 1955 he became the first District Director of South Carolina and remain in that capacity until 1967. In 1968 he was elected Southern Regional Vice President and held that position until 1972. Brother Chatman strongly believed that education would open all doors to success. He worked tirelessly to improve the education system in Greenville County for more than 30 years. The Gamma Gamma Lambda Chapter and new Foundation, Alpha Phi Alpha Greenville Foundation, looks forward to a lifelong relationship with Ronald and is committed to helping him and others within the community. If you or anyone you know is interested in this scholarship please reach out to any member of the chapter or you can email Brother Kynan Robinson, scholarship@alphagreenville.org for more details.